There are some products from Shenzhen that are pretty good — even world class — such as the DJI Phantom drones. Is the X360 camera one of them? Hit the jump to find out. 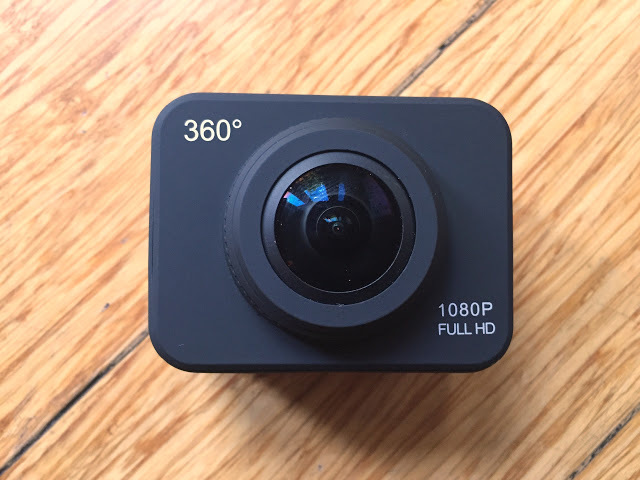 Looking at the specs and features, it seems pretty interesting compared to other cheap 360-degree cameras. We’ll examine the specs and features one by one. It comes with an impressive array of accessories, and even includes a 32GB Sandisk Micro SD card (however, I’m not assuming the authenticity of the Micro SD’s branding). 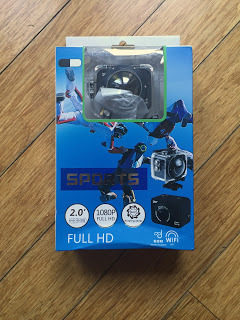 The accessories appear to be compatible with some GoPro mounts. But I don’t have a GoPro to test, so I can’t guarantee that. The camera has a simple interface. There are 4 buttons: power, shutter, up, and down. There is also a a color LCD display at the back. Holding down the power button turns on the camera. The startup time is fairly slow, taking about 15 seconds. It always turns on in video mode, and after the Welcome screen, before you have even pressed the shutter, it already has started recording (about 5 seconds). If you prefer taking photos, you have to stop the video recording and switch to photo mode first. Holding down the shutter button toggles between video mode, photo mode, and playback mode. Pressing the power button while the camera is on toggles between the shooting menu and settings menu, and exiting the menus. In each menu, there are a few icons, and you use the up and down button to navigate, then the shutter button to select the option. The interface is simple and easy to understand. Whether shooting in photo or video, you can choose from several shooting modes, including a circular fisheye, a partly de-fished view, and in video mode, an equirectangular view (which is the standard format for 360 videos). The camera provides a live preview of whichever shooting mode you choose, in real-time, with no significant delay. Self-timer: works as advertised. There is a visual countdown, although no auditory countdown. Time lapse mode: you select an interval up to 60 seconds. 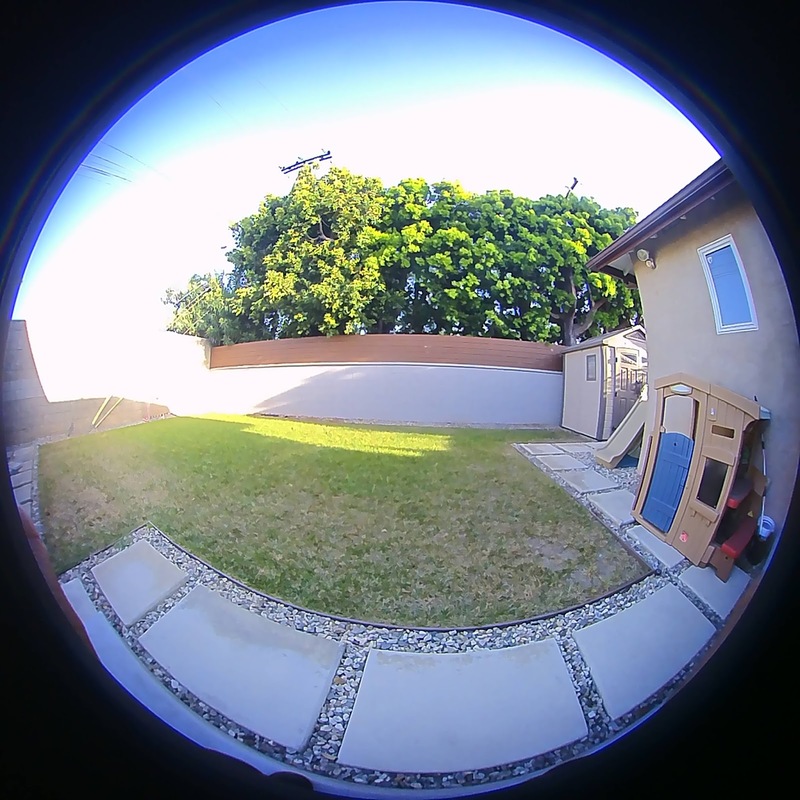 The camera takes images (unclear if photo or video) then compiles it into a video. There is no way to extract individual frames except possibly as video stills. The main problem however, is that it only worked literally once. After viewing once on the camera, the file got corrupted. All other attempts showed a corrupted file. Loop record: in theory, this could be used for dash cams or security cams, where it would continuously record a video of a fixed duration, so you could press the shutter when something significant happens, and it would store only the last few minutes of video. But the loop record of the X360 doesn’t work like that. Instead, you select the duration (1, 3, 5 minutes), and it will keep recording in 1, 3, or 5 minute clips. It will not overwrite the old files. I didn’t wait to see if it would begin overwriting files after the memory card is filled up. 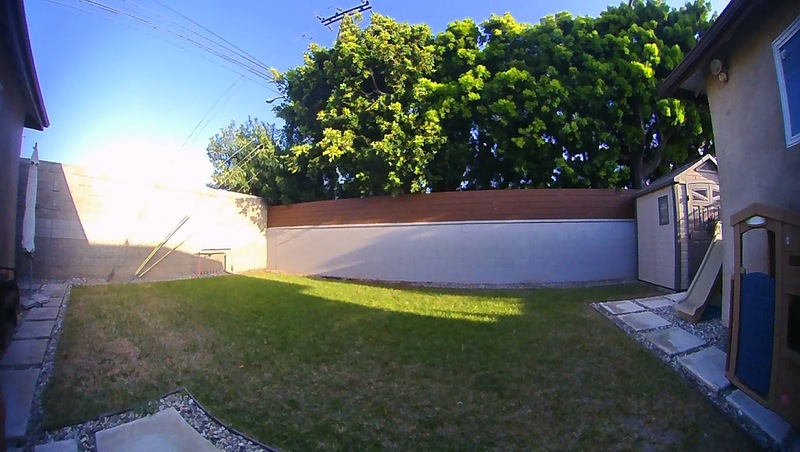 HDR mode: the video has a “WDR mode” which can be on or off. I didn’t notice any difference between the two settings. THere is no HDR mode in photo. 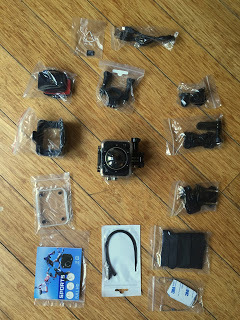 GSensor: the seller said this is image stabilization. I didn’t test this much, but I didn’t observe any difference between it being on (level 4) or off. Wi-Fi connectivity: Some sellers claim it connects to an iOS or Android phone. I couldn’t tell because I couldn’t find any iPhone app. I even tried the XDV360 app for iOS, and although my phone seemed to be able to connect to the camera’s WiFi signal, there was nothing I could do to control or view the camera. It therefore appears that the 12-mp version is nothing but a resized version of the 3mp image. In fact, the images seem to have less detail than even the Lytro 1st generation (1080×1080, 1.2mp). Don’t believe me? Here. Makes me wonder where they dug up the POS sensor they used for this camera. In case you’re curious, here’s the partially de-fished mode. The resolution at this mode is 1344 x 1344 at 30 fps. Sorry it’s just a crappy test video, but that’s all I could get. You’ll find out later why. I tested the waterproof case, and it did keep the camera dry under a shower. 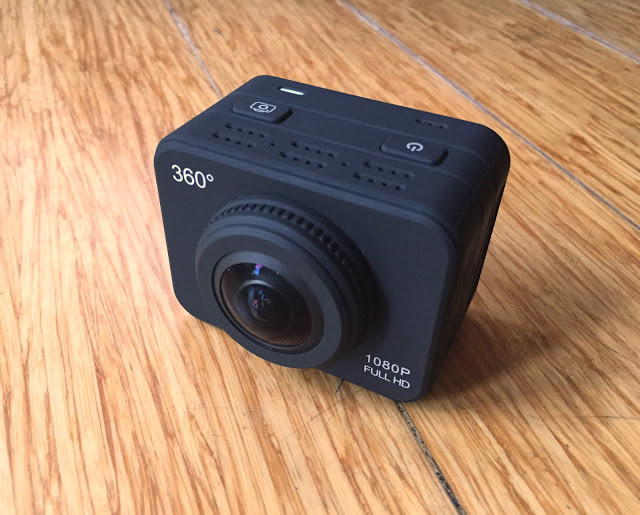 So yes, it can take a hemispherical 360-degree video that can be viewed and rotated in YouTube. But you would have to be pretty desperate to use it, in my opinion. Beyond the horrible image quality, the X360 was extremely prone to freezing/crashing. Majority of the time, when connected via USB to a computer, it would either freeze or if it is able to connect, it would freeze in the middle of viewing the cameras’ file directory (before even downloading). That’s the honest reason why it took me far longer to post this review than I expected. I had a lot of difficulty even downloading the samples from the camera! But the X360 would also freeze on other occasions. It was extremely unpredictable. I would turn it on and it would get stuck on the Welcome screen, even if I didn’t do anything. Sometimes it would freeze while taking a video. Other times it would freeze when shutting down. Finally, this morning, it just stopped working altogether. Not even to just freeze up. It’s possible that the X360 I got was a lemon. But without evidence to the contrary, my presumption is that the copy I got is representative of other X360 cameras. I also want to emphasize that I’m also not saying that other cheap cameras from China are necessarily bad. The Amkov AMK100S, for example, looks significantly better than the X360 based on the sample videos I’ve seen.